Ben Affleck has been having a hard time as of late, but I’d love to draw your attention to the fact that maybe, just maybe, things are turning around for him. 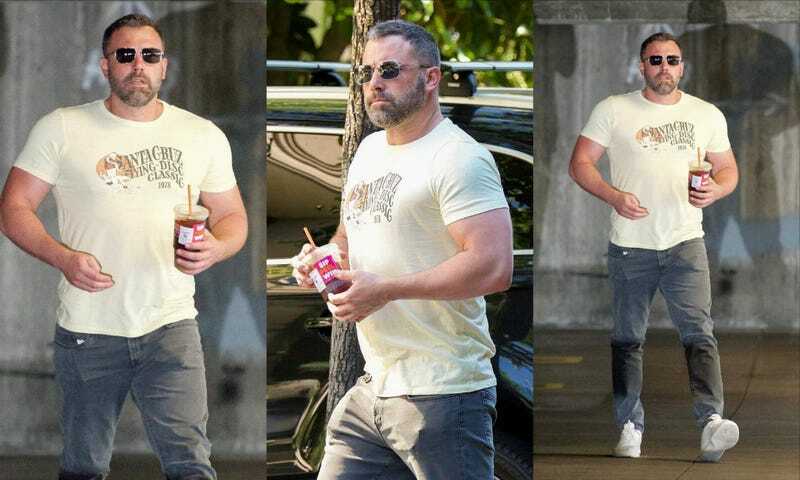 This is what Ben Affleck looks like now, in the throes of a rehab glow up, clutching a sweaty iced Dunkin’ java in his meaty lil’ paw, walking around with a brand new upper torso balanced on the same lower torso he previously had. The phoenix tattoo that traverses the newly-broad expanse of his trapezius and his lattissimus dorsi has more rippling terrain over which to spread its fiery wings. His shoulders are so broad. His body tapers to a point, like Johnny Bravo. He’s a big, buff man who probably quit smoking, has transitioned to Juuling, and will eventually release the big, yogic breath that he is holding his body to make his muscles look puffy. How many reps? Tell me about your preferred protein powder flavor? Does he have one of those little plastic cups with the metal thingie in it that jangles when you shake it? You know, for protein? Is it keto? Is it arm day only? Is it shoulders day? Obliques? Lats? Traps? Walk me through your daily routine, sir, I am genuinely curious and also happy that you are now a big body boy whose buff arms cannot reasonably touch the sides of your trim waist. Buffleck. Swolber. Big muscles. Glad he’s fine!